Welcome to "The Weasel's Last Fart!" | It's the little corner of the Internet you can find through an odd address. This box set’s packaging is a hard cardboard box with room for two standard DVD cases and a slim book. The box itself looks nice, but it’s one of those cheaply made “wrap a paper around a cardboard box” type of boxes. I can see this thing ripping or coming undone within a year. It’s really just paper glued onto a box. If you have a FUNimation DragonBall Z DragonBox you know what I mean. Yes, I know FUNimation sometimes puts these slips of paper on the back of the box so people have some description of the thing in the store, but that’s not the case here. This slip of paper is actually a sticker. If you wanted you could peel off the back and carefully stick it on the back of the box. I’ve never seen that before. I didn’t peel it, I just saved it in the box. I didn’t wanna ruin the nice box art. I don’t have a Blu ray disc drive so I really can’t take any screen shots. 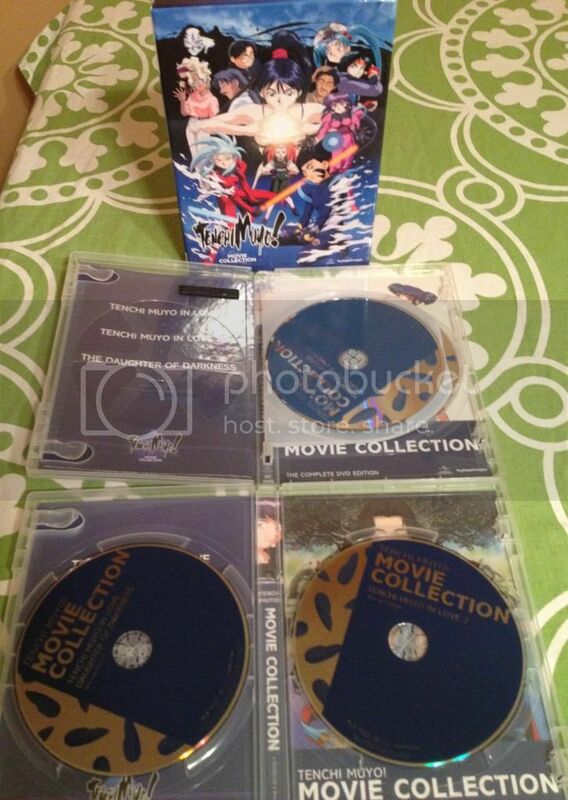 So while I’m going to be talking about both, the main focus is going to be the DVD version. There really isn’t much in the way of extra’s. 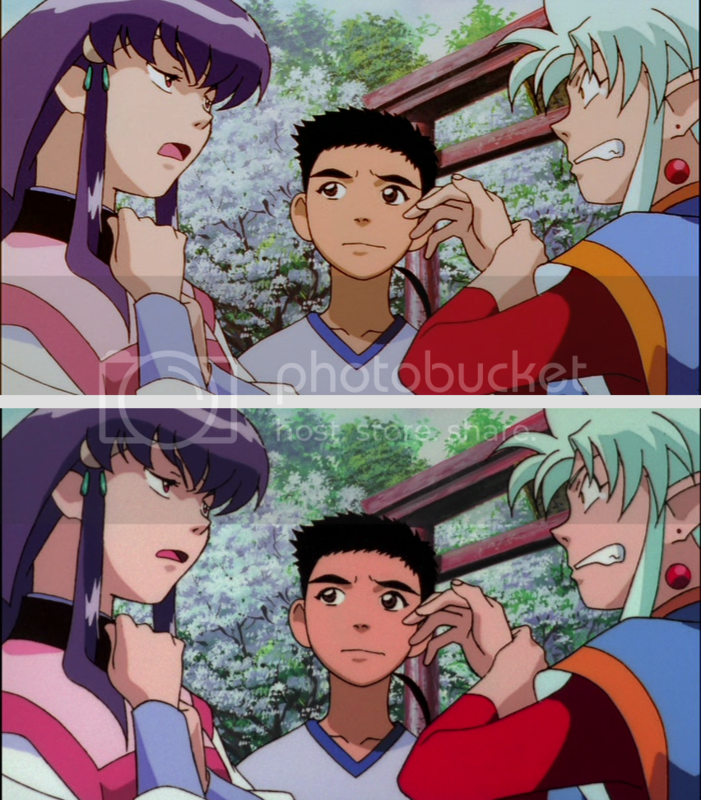 Sure you get the original Japanese trailer for the third Tenchi movie but, the original Pioneer version had a bit more in this area. It’s really not a major loss. You get an art book, I think that should be considered the extra. See?! Doesn’t that look so much better when it’s not blacked out?! Also, the non-anamorphic widescreen doesn’t help either. Thank god we don’t have to deal with that here! 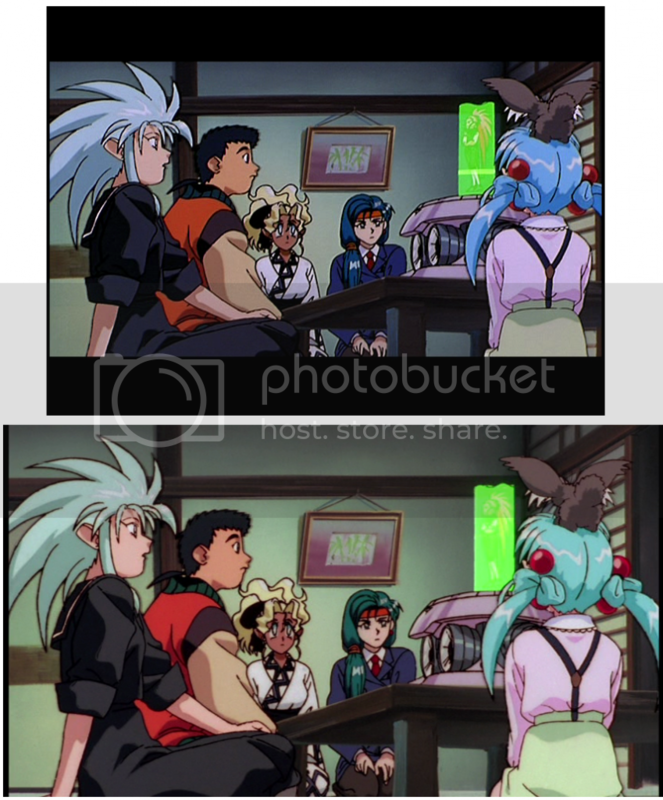 Sure, it looks all nice and polished, but I’m you noticed Ryoko’s hair didn’t you? In the original Pioneer version it’s blue and in this new transfer it’s blueish green. Is this a bad thing? Me personally, I don’t think it’s so horrible. But the thing about the colors is that… yea, it might be a little different than what you might remember. In this next shot check out the woman in the background on the right with the skirt. Her skirt went from blue to a teal color and her shirt went from purple to pink. And now I’m sure you’re gonna look at other things in the background as well. This is really the only place I noticed something so drastic that it’s just not there in this transfer. 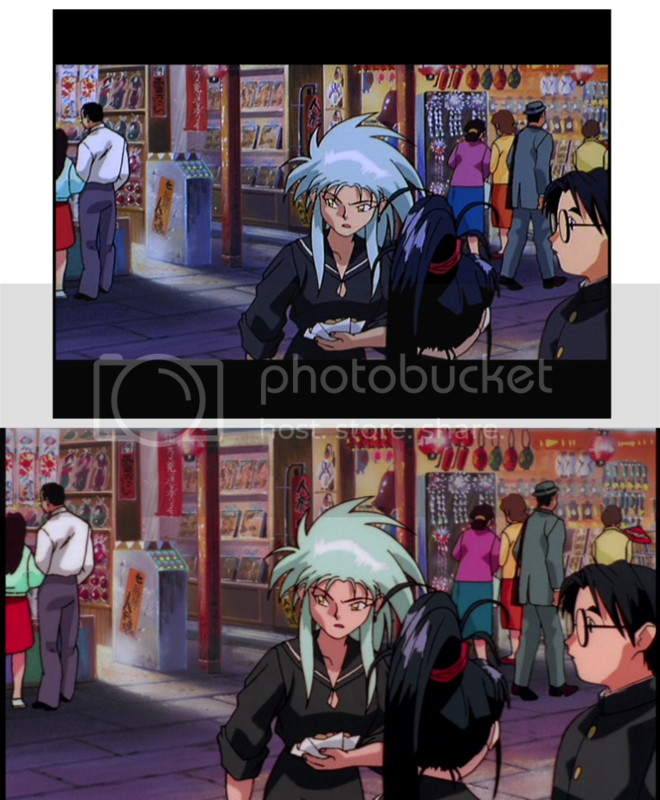 Up until now I haven’t put up any shots from Tenchi Forever, and there’s a reason for that. I feel like I have to talk about it separately. 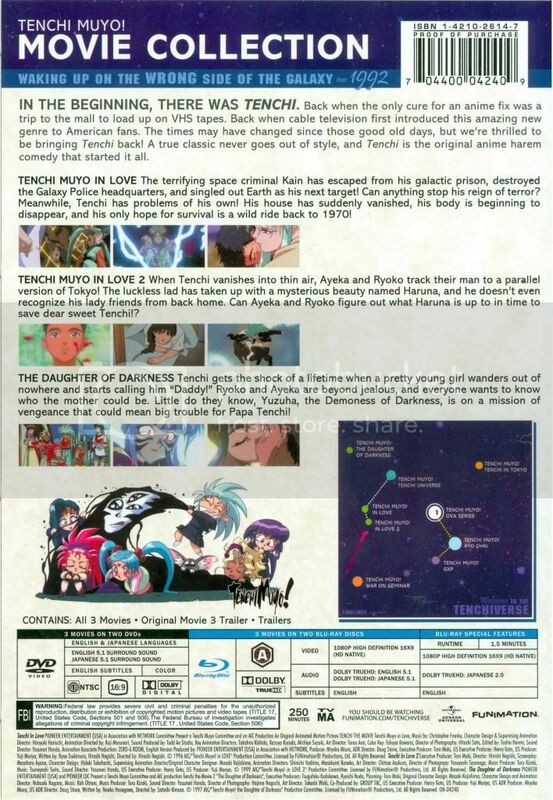 The first thing I wanna point out about this movie is that the Pioneer title “Tenchi Forever” is now gone. It’s just called “Tenchi Muyo in Love 2”. 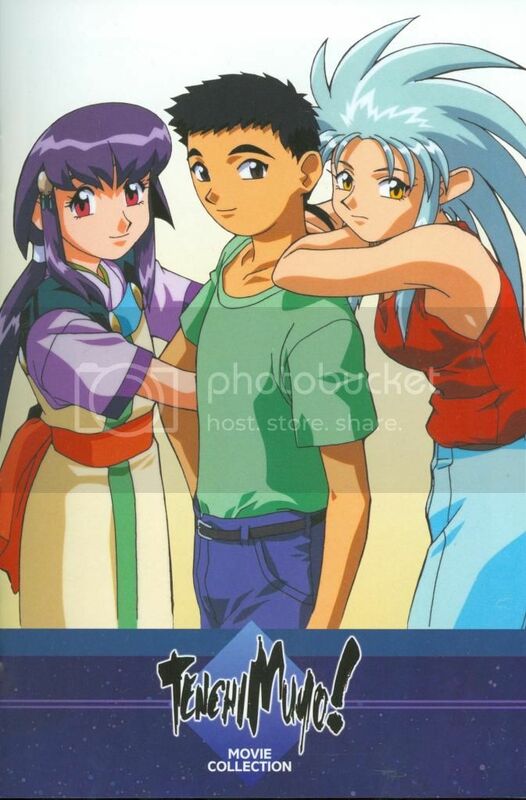 It’s closer to the original Japanese title which was “Tenchi Muyo in Love 2 – Distant Memories”. Pioneer released this movie in anemorphic widescreen and so, it’s a little bit easier to compare shots. While this version seems to look the closest out of all the movies to the Pioneer version, this new version seems to have the colors bumped up just a bit. The Pioneer version does look a little sharper though. So, it’s a little bit of give and take here. Honestly, I could go with either version and be happy. 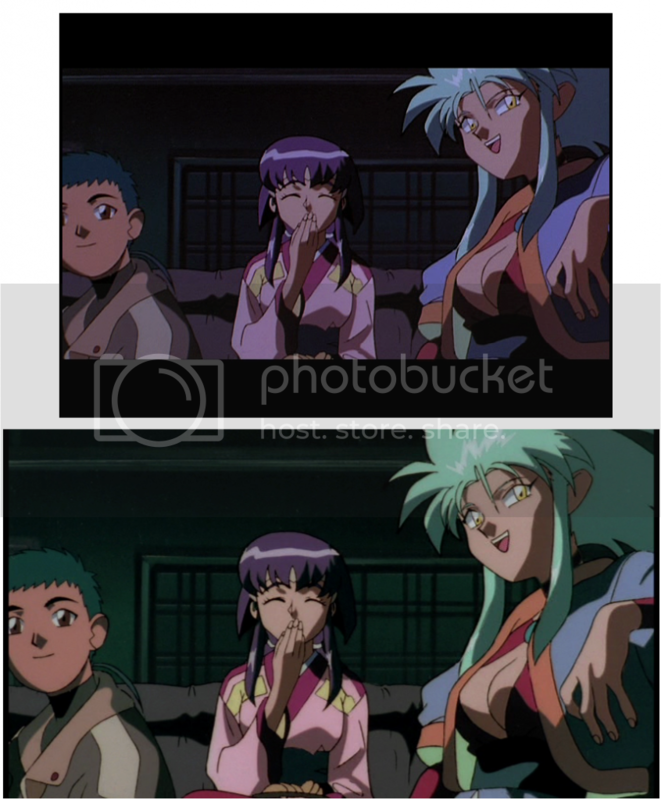 The movies that needed the upgrade the most were the first two Tenchi movies. In my eyes, they got the upgrade they needed. So, in conclusion: is this box set worth it, even with the flaws I pointed out? I would say… yes. Some people don’t see these as flaws. I think I may be one of those people. 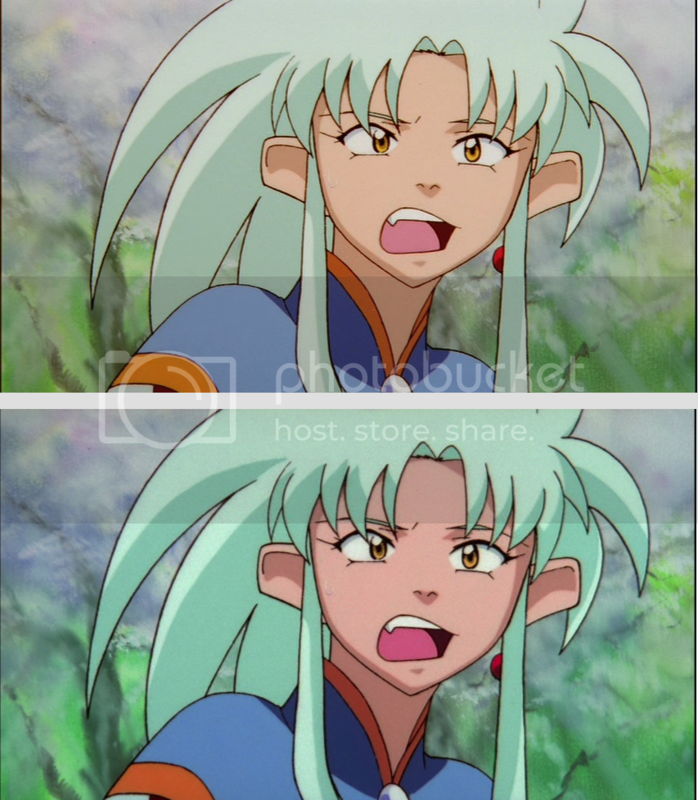 Does Ryoko’s hair color bother me? I don’t know which pallet is really the true original intended color pallet. Honestly I didn’t notice it was different until I started to compare screen shots. When I first popped this in, my initial thought was that it looked beautiful. 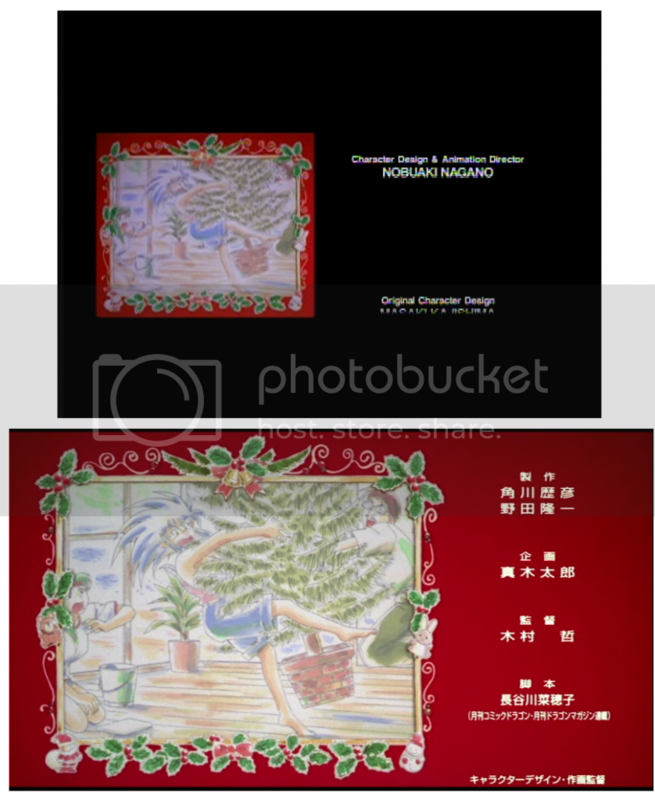 If I never compared the two versions, I wouldn’t have known about the color change. 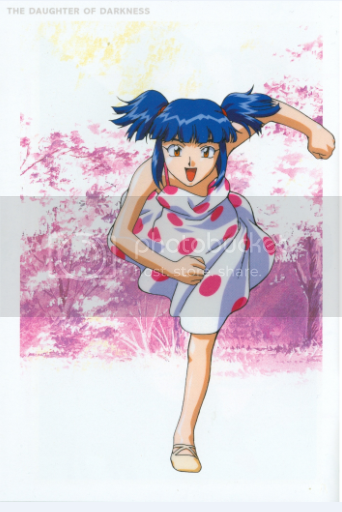 I’m thinking the teal color is closer to the original color since it shows up in both the Pioneer and FUNimation version of Tenchi in Love 2. Ignorance is bliss in my case, I suppose. You now have an idea of what to except, it’s really up to you.